This is a personal family story, but I felt it was appropriate for the Christmas and New Year Season since the attached poem illustrates the lives of Leon and Rachel Gathany in their Toccoa home. When I lived in Pennsylvania, my family and I would often travel to Georgia for the holidays and spend Christmas with Leon and Rachel. 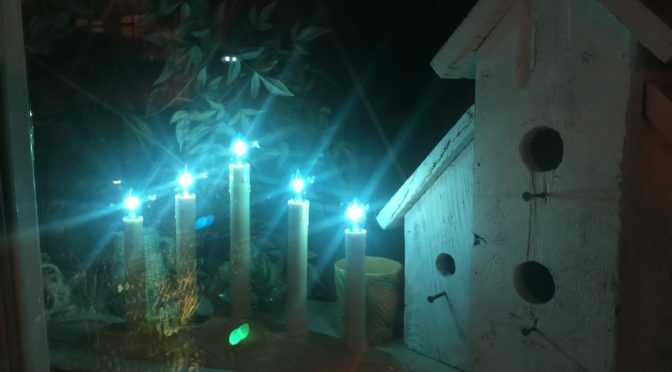 One of my children’s favorite memories was arriving at their grandparents’ home in Georgia and seeing a candelabra in the front window lit with blue bulbs. The blue candles fascinated my oldest son, Nicholas, since he thought the blue lights were not the colors you would expect from candles. Grandma Rachel had obtained the candelabra years ago when she lived in Pennsylvania and family friends were moving to Florida and downsizing. These Christmas decorations included many items that today would we considered vintage. Apparently, the donated candelabra always had blue candles and Rachel continued using this blue color for the bulbs in her several homes in Pennsylvania, Minnesota and Georgia. The poem was written in commemoration of those visits to Grandpa’s and Grandma’s home and the sights and events surrounding the holiday season. For example, Leon traditionally read the poem, “When Father Carves the Duck,” before we sang a seasonal hymn and were finally allowed to enjoy Rachel’s delicious holiday feast. Rachel would sit down at the piano to play and sing Christmas songs with her grandchildren. Our visit would not be complete without a tour of the log barn to view the progress in restoring this vintage building and in organizing Leon’s mounted animal displays and other collections. Many of those items are now in the Leon & Rachel Gathany Museum of Natural History on the Toccoa Falls College campus. Rachel wasn’t fond of one line in the poem, the one about gag gifts. However, she had a mischievous side to her and we expected that at least one family member would get a “white elephant” gift, something unusual that would cause much laughter. So, whether or not you ever visited Leon & Rachel Gathany in their Toccoa home, read this poem and imagine you’re there during the holiday season. What would you see and hear? and stoking up the fire. while her grandkids play along. the reading and the song. with roadkill to be mounted. and blessing to be counted. right for the coming spring. barn and surely these precious two. wrapped and placed beneath the tree.